The future of manufacturing has been captured in an advanced i-Automation innovation concept that is based on integrated, intelligent and interactive. At Hannover Messe 2017 these concepts will be featured on the booth and showcased in live demonstrations. The 3i-approach to innovation by automation provides all of the core competencies and interoperable solutions required to master manufacturing digitalization. It helps customers leverage this rapidly expanding global opportunity. Transformation to Industry 4.0 is a journey that all stakeholders travel together. At the booth we will show how to support a transition to the Connected, Collaborative and Smart factories of the future. A Connected Factory is about seamlessly integrating machine automation and corporate IT to generate, collect and exchange large volumes of relevant real-time data. ’IO-Link enabled sensors and actuators for IoT are the first inch to vertical integrate field data into a digitalized infrastructure, essential for use at smart manufacturing sites’, says Lucian Dold, General Manager Product & Solution Marketing, EMEA. A demo accentuates the smart use of vertically and horizontally integrated systems with, respectively, Viper and LD mobile robots and leading control and sensing technology. Robert Brooks, European Industry Marketing Manager F&B, is convinced that data is the key to Overall Equipment Effectiveness and the smart factories of the future. The demo at the booth demonstrates how enabling intelligent data analysis and evaluation capabilities can realise predictive maintenance, process improvements, customization, serialisation, traceability and a reduction in resources, energy and waste. All facilitated by the Sysmac controller and fully integrated robotics with the fastest Delta robot in the market. 'Our highly specialized owned core technologies add the Think Dimension to manufacturing today to enable producers to innovate to Industry 4.0 smart factories and improve their output', remarks Peter Cusack, Head of Strategic Marketing. To showcase our advanced technologies, the 3rd generation of FORPHEUS is featured. 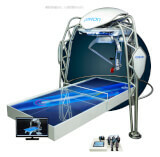 The friendly and smart table tennis collaborative robot has become a whole lot smarter since last year. We have given FORPHEUS the ability to interpret, predict, learn, think, act, connect and communicate with humans. Seven amazing techniques that make it possible for FORPHEUS to actually tutor humans. 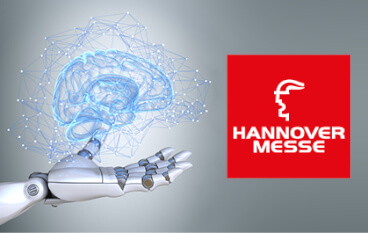 Visit us at the Hannover Messe, 24 - 28 April, to play with Forpheus and experience the integrated, intelligent and interactive automation technologies in Hall 9, booth F24. Omron experts will answer all questions and the demonstrations will run continuously. Four great demo's, including a world première and a collaborative robot that was recently certified by Guinness World RecordsTM, with our innovative Omron signature. A signature that again has earned Omron a place in the Top 100 Global Innovators according to Clarivate Analytics. Innovation by automation enabling innovation in manufacturing.